Samsung has applied for a US patent (PDF) for a foldable mobile device, giving important clues as to how it’s approaching the market with the new technology. The Korean firm's display division already leads the market in several notable areas, and the chaebol has done little to quell speculation that a device with a flexible display was coming: in an earnings statement in January, Samsung boasted that in 2018 it would "reinforce its competencies in new applications such as foldable [displays]." A report that month suggested that volume production would begin this year. The device is said to be codenamed "Winner". But what would such a device look like? The patent application concerns itself with protecting methods of controlling a flexible display, and a bendy device that resembles a hinged Psion (or Gemini) is described as [the] “best mode for carrying out the invention”. This is described as containing: “…a flexible display that has a foldable deformable part; a housing that is foldable and forms an enclosure when the flexible display is deformed…” This design contains a “shape maintaining part” - which may or may not be flexible - attached to the “deformable part”. The thinking here is not to replicate the tablet form factor of the smartphone, but to allow a device to be put away when not in use. It also allows a conventional tablet to take up much less space when not in use. Clamshell phones have all but died out, which suggests Samsung has a big market job persuading the public that the benefit of the form factor outweighs the inconvenience of unfolding it. 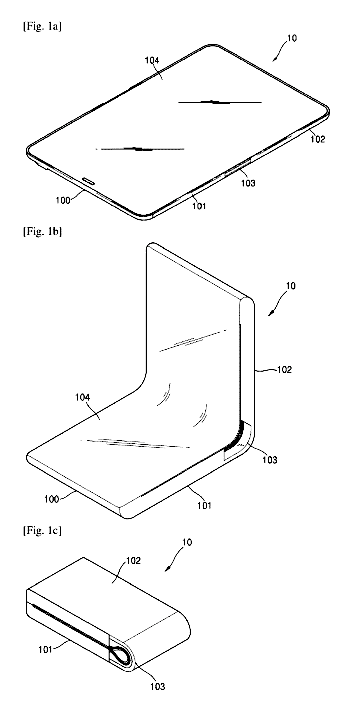 Microsoft has been thinking along parallel lines for its "Paperback Writer": a foldable pamphlet-style device with flexible pages appeared in patent applications filed earlier this year. China’s BOE Technology Group claimed to have delivered production samples of a flexible OLED according to Nikkei Asian Review and devices are predicted for early 2019. Huawei is keen to demonstrate it has one over on its great Korean rival. If BOE can deliver, then customers include Xiaomi and Oppo.